Manorama Thozhilveedhi, one of the leading employment weekly in Kerala has published the latest issue (28th June 2014) for the readers. The major highlight of the current issue would be the IBPS 2015 notification, NDA admission 2014, PSC last grade ranklist and solved paper of Village Extension Officer (VEO). Short list of Police Constable Driver (Malappuram), Rank list of Lab Assistant have also found place in this issue. While going through the pages, arising vacancies in Universities like Veterinary, Calicut and Mahatma Gandhi would enable people with desired qualification to apply for the posts. 1203 constable/driver vacancies in CISF, vacancies in Naval dockyard, 121 officers in Army, Officer and Office Assistant in Kerala Gramin Bank will satisfy the job seekers. As the notification for Sub Inspector of Police, Excise Inspector and Excise Guard got published earlier, questions and answers focusing on GK, Indian Constitution, Indian History, Science, English and Mathematics are given for reference. Aspirants seeking job with the Kerala PSC can use the question paper to prepare for the upcoming exam to be held in August. Prime importance is given for Crash coaching for Last Grade exam, TET and SBI. With the first phase of Last Grade Servant exam begins in September 2014, this would be the perfect time to start preparation. Solved question papers of Cooperative Service Clerk and Secretary will enable the job aspires to prepare for the upcoming exams. Special coaching for K-TET,LP/UP, HSA, DEd & Pre Primary/Nursery teacher are also given focus. Exam coaching for SBI by Time Institute is continued in the 28th June 2014 issue too. Job seekers can best use the current issue to check for rising opportunities and also could apply for their preferred posts. 'Thozhilveedhi' which has already become the part of life of many youngsters is an effective platform for job vacancies and career training. With a circulation of more than 1 lakh, 'Thozhilveedhi' has truly changed the life of many youngsters. 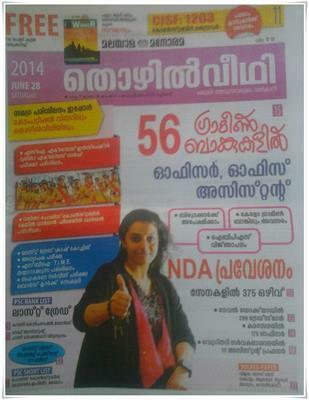 Malayala Manorama Thozhilveedhi 26th July 2014 issue (21th July - Today) is now in stands. To read the latest issue of Malayala Manorama Thozhilveedhi dated 21 July 2014, just buy a copy from your local book vendor. Thozhilveedhi from M M Group is one of the leading employment weekly featuring updated news on arising opportunities in public and private sectors.